Today is Record Store Day 2010 and this time the buzz has hit the UK. I have just watched the most hilarious article on early BBC NEWS TV discussing vinyl and how this "outdated" format is now "back in fashion". Come on, please!! 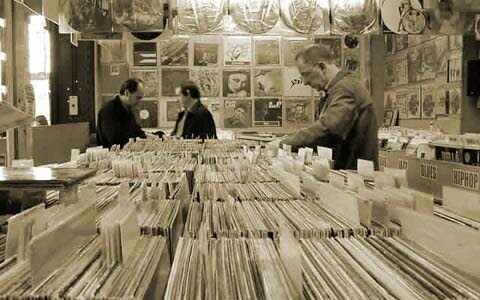 Buying records isn't a fashion for Christ's sake, I've NEVER stopped buying records over the last 30 years. Even when CDs arrived in the 80's I ignored the format and continued hunting for wax. And the same goes for the mp3 revolution. I'm not saying I do not own any of the latter 2 formats, just that records for me have ALWAYS been my format of choice. So I am amused that the media declares "vinyl is back". 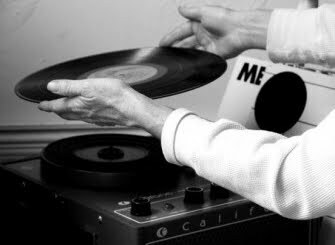 For me the love of vinyl never went away, and in my world, every day is Record Store Day. Taken from their website: "The original idea for Record Store Day was conceived by Chris Brown, and was founded in 2007 by Eric Levin, Michael Kurtz, Carrie Colliton, Amy Dorfman, Don Van Cleave and Brian Poehner as a celebration of the unique culture surrounding over 700 independently owned record stores in the USA, and hundreds of similar stores internationally. This is the one day that all of the independently owned record stores come together with artists to celebrate the art of music. Special vinyl and CD releases and various promotional products are made exclusively for the day and hundreds of artists in the United States and in various countries across the globe make special appearances and performances. Festivities include performances, cook-outs, meet & greets with artists, parades, djs spinning records and on and on. Metallica officially kicked off Record Store Day at Rasputin Music in San Francisco on April 19 2008 and Record Store Day is now celebrated the third Saturday every April." So as much as I'm happy to see people supporting their independent music shops, I also think the help has come a little too late with many of our independent record shops going out of business in the last 10 years already. 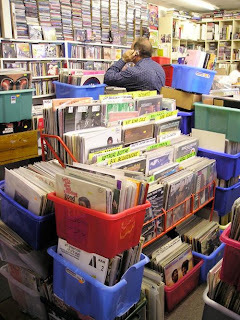 The surge of downloading music from the internet has certainly kicked every aspect of the music industry right up the arse, and the independent shops are where it was felt hardest as they were practically cut out of the buying chain. Hopefully we will continue to see the appreciation of real music, real records, real shops and less of that spoon-fed drivel that we suffered since 2000. 1. Sometimes in a record shop, the LP and 12" sleeves will be so tightly packed in the racks it is impossible to flick through them without physically creasing the covers. A record graded as MINT will eventually be VG by the time everyone has thumbed and pulled it about. You could try to remove a handful of wax to ease browsing, at which point the sales assistant will scream "don't pull records out of the racks please" or "make sure they go back in the correct section mate". You can't win. That filing system took them years to think of and put into practice, so there's no way they are gonna change it for YOU! 2. At some point you might have to suffer the local record shop nutter (every shop has a regular weirdo that comes in). And he or she will not think twice about standing next to you and sparking up a conversation while you are trying to concentrate. Normally they smell pretty bad too and love to touch - that's not a good look. If you are very unlucky, then the weirdo may also decide to try and follow you home. In this situation do not panic, simply return to the shop where they will no doubt latch on to someone else for the rest of the day. Problem solved ... until next time. and also chucked out once because the owner wanted to spend his day's taking on a prostitute. (Ahem!) I even had the money snatched out of my hand by one record dealer BEFORE I was ready to pay, so keen was he to fill his till. I also had the same shop owner (YOU know who you are) try to charge me £10 for a record I found in his bargain bin once simply because paranoia set in that I "may" be ripping him off. Needless to say I take my business elsewhere, and that's a LOT of business. 4. Quite regularly you will find an LP sleeve out in their racks at a bargain price, and this can make your day's hunt worthwhile. Until you get to the counter to be told they can't find the actual record, or it may be misfiled somewhere. It's always the record you really want, never the one you are not so bothered about. And if that doesn't piss you off enough, you will return to the shop a few weeks later and the sleeve is back out in the racks. Oh they must have found it, so you take it to the counter, just to be told again ... "sorry mate I can't find this one". AGHHHHH!!!! 5. But at least there'll be no crashing of i-tunes, no flashing pop-up adverts, no 45seconds waiting to download, and you might even find something you weren't expecting or would never think to look at. Maybe an LP you have never seen before, or a promo only 12" with that extra track you wanted. Even a recommendation from the knowledgeable shop staff (these people can be your friends if you ask politely). It's much more fun than pressing GO on your keyboard and staring at your ipod display. And it sounds so much BETTER! So get out there and get your fingers dusty. The irony for me today is that I am awaiting surgery for an ongoing problem on Monday, so this weekend is probably the ONLY weekend of the year you WILL NOT find me in a record store. But that doesn't stop you.